Teaser: Lucky to have a good first experience, but after the finish line the wheels came off! Sorry for the length, but thanks to the encouragement of Mid MD Legend, Mark Yost, Chris and I wanted to put it on paper for all my friends, coaches and team mates to get an idea how my day played out. 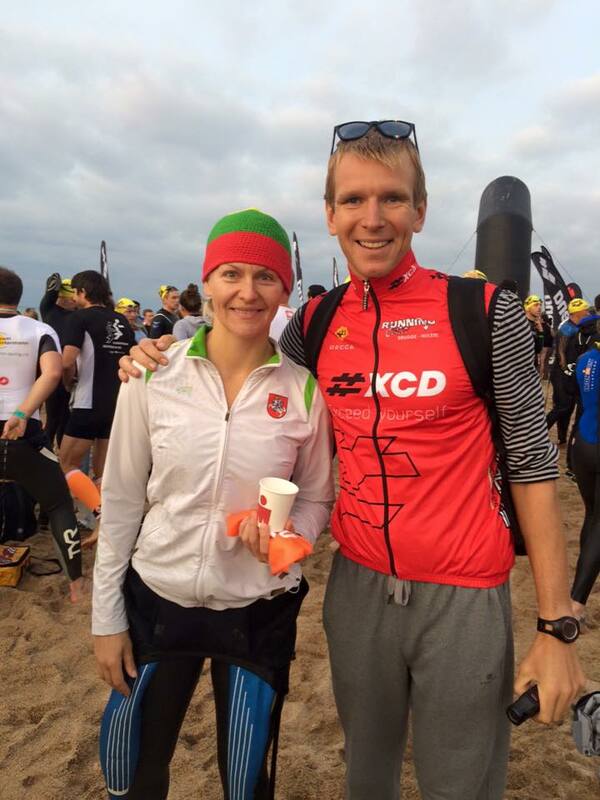 Let me start my first ever race report (short novel) by stating that I am one of those triathletes who entered this world 5 years ago with the Irongirl sprint triathlon in Columbia MD. I always looked at the full Ironman race as an insane mountain to climb with little to no interest in pursuing. When you hang around the pool long enough, you will eventually get thrown in the deep end. 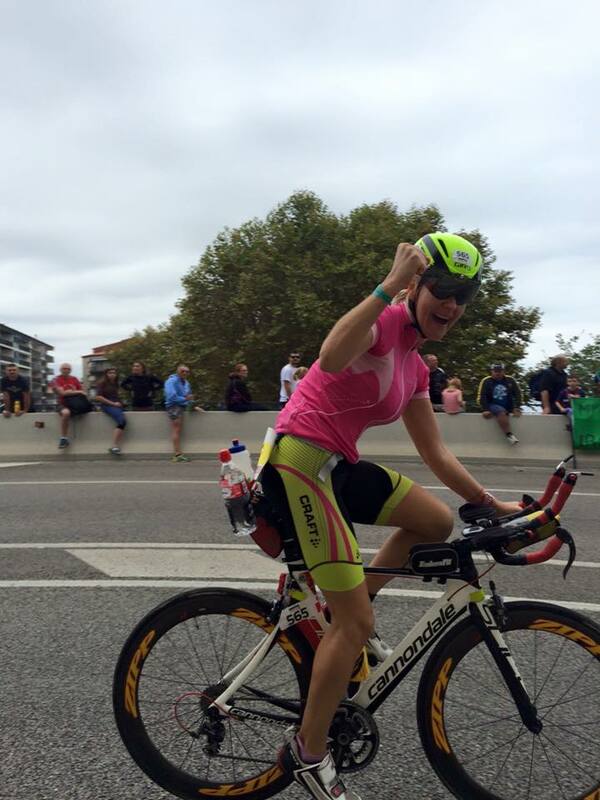 And so almost a year ago, I hit the “enter” button for IM Barcelona. 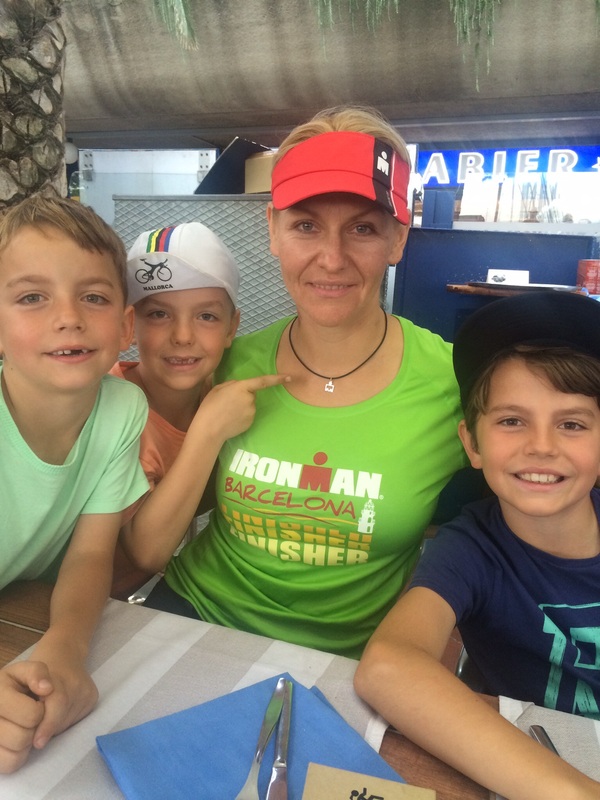 Thanks to an awesome triathlon club in Tallinn, Estonia (called 21CC Triathlonclub) all 5 members of our family train several times a week. Preparing became routine. Living, training and interacting with athletes and coaches in Europe was tremendous in getting the work done which Chris thought I would need to “finish” a full race and enjoy it. Getting the training in months ahead of the race is one thing, but performing on race day is a fear everyone has because a lot can happen when the horn blows. We flew direct from Tallinn to Girona airport (outside Barcelona) and had a mini bus pick up all 5 of us (my husband Chris and three boys) 4 suitcases and a bike en route to an apartment we rented in Calella. Downtown Barcelona was about 45 minute away from Calella. We arrived to our apartment after midnight (early Saturday morning and the race was on Sunday) and rushed to bed in hopes to get one last good night of sleep. No problems there. In the morning my “bike fairy” Chris put the bike together and we were off to athletes village for packet pick up and race briefing which was luckily 300m away from our apartment (way awesome). The beach town has an incredible view and is coolest race venue I have ever attended. to be finished/cutoff in 15:30 hours. I really thought I misheard him and turned to Chris to confirm if it was true? To me and others, now the pressure was on. That did not help my headache I had all morning. After lunch we returned home to pack and finalize transition bags and check the bike one more time before drop-off between 2:30 - 6:30. Unfortunately, I was starting to feel worse. I wasn’t sure if it was nerves, the pressure to finish in less than 15:30 hours or a motion sickness patch I put on for the flight the day before. I kept the patch on because it lasts 1-3 days in hopes it would also help me prevent sea sickness during the swim in the Mediterranean. None the less I felt so bad that I told Chris I am going to take a nap and he should wake me up in 1 hour. That was a brilliant idea but the headache didn’t go away. Off to drop off the bike and transition bags. The area was about 1.5 km away from our apartment (not way cool). I took my bike for a ride to make sure everything was in place and functioning. Chris carried my transition bags and on the way he stopped to purchase a VIP spectator package which will give him special access during the swim start and run finish. Racking the bike and bag drop of was uneventful and we went for early dinner. Dinner consisted of local sea bass with potatoes and grilled vegetables. Shower and in bed by 8:30 pm. Don’t even remember falling asleep then the next thing I new my alarm was going of at 5:15 am. To my happy surprise I didn’t turn my iPhone clock to Spain time (Estonia is one hour earlier) and I still had an extra hour left. Wooo hooo! Second alarm goes of at 5:15 am Barcelona time and I woke up well rested and no longer with a headache. I stretched a little and realized my motion sickness patch fell off. Slight panic set in regarding the swim but knowing my headache was gone which I speculated was caused by the patch was a relief. For breakfast I had a cup of coffee, two fried eggs and two pieces of toast. I put my bathing suite on, grabbed my wet suite, goggles, swim cap and off to the race start 1.5k away. As we walked on the board walk the sun was rising peacefully, the sea looked calm and athletes were focused but relaxed. Into transition with VIP husband next to my side - that was very special as I appreciated the extra support. I unwrapped my bike from its rain coat and Chris pumped up the tires. I put on my two bottles with CarboPro and EFS mix in my back seat cages and a bottle of clear water in my down tub cage. In my air hammock (basket between my aerobars) I put a sports drink bottle with 8 Sis gels in it. Thanks to fellow Ironman friend Jannus Juss (I believe Marko Albert told him the tip), this suggestion makes gel intake very easy, clean, efficient and no trash to deal with. Sis gels are very runny and require no additional water to take. In my bento box I had two magnesium liquid tubes and 4 Sis bars cut in half for easy opening. I went into the changing tent, applied glide to all the special places (although I still got a neck rash) put on my wet suite, ate a banana and started to make my way to the beach. There we met up with this years Chattanooga Ironman champion Estonian Kirill Kotšegarov- who gave me last minute top secret advice. Then I took two salt pills, an Excedrin pill and one Sis gel. I then lined myself (rolling start) in the 1:10 - 1:14 hour swim group and waited….and waited. It felt that the race will never start. Sometime around 8:45-8:50 the rolling start began (pros were off at 8:30). I remember being very calm and visualizing my whole race. Now that I look back - I stared to visualize my race about 2 weeks before the race and just kept perfecting it in my brain. I had emergency plans in place but mostly I thought of positive situations. As I was moving through the swim shoot, I saw Chris one last time and gave him a kiss then down the beach into the Mediterranean. The waves looked bigger than earlier that morning. Luckily, it didn’t scare me anymore - I was confident and aggressive right from the start even though I was surrounded by the yellow caps that the men had on (I donned orange). Even though the Mediterranean waves were more grandiose than the Baltic I trained in, the water was warm and I learned the only way to see buoys was on the top of the wave crest. I wasted little time sighting and just waited for my stomach to tell me when I was on top of the wave, quick sight and keep swimming. Per my husband, I was to find feet and draft off of them. Every time I would catch someones feet, swoosh, the waves would take them away. I found myself waisting time on feet searching and decided to focus on my stroke and rhythm. Even with the rolling start, each turn buoy (it was one loop, 3,800m) had crowds of swimmers and a little congestion. Thanks to 21CC Triathlonclub outdoor swim trainings, we simulating water entry, going round boys and exit. Having the proper training, I was more confident to attack buoys. I knew I had to pick up my foot kick to scare anyone behind me trying to swim over top of me and stay aggressive till in the straight again. There were 4 turn buoys and I believe I turned each one faster and faster. More than half way into the swim I knew I was getting queasy to my stomach, but if I tried to stabilize my hips and keep my head a tad higher that makes me feel better. So I did that till the end of the last buoy and then started to sprint for the beach finish. I was so excited to see the finish arch but knew the last few hundred meters swimming into the shore with the waves could cause problems. At the top of the wave you get push forward but at the bottom of it you get pulled back. Again, thanks to the Baltic - she gave me many opportunities to practice that exact swim into the shore so I new I had to keep my hips parallel to the ground as much as possible and kick harder at the bottom of the wave to keep moving forward. 20 meters left and the final wave swallowed me up and dropped me at a volunteers feet who graciously picked me up standing. I got my vertical bearings and jogged up the beach. It felt so good to run through fresh water sprinklers and rinse out my mouth. I hit my watch to end my swim leg. Learning to swim a few years ago, I really owe my swim comfort and technique to my club 21CC Triathlonclub swim coaches, especially Alma Sarapuu who always patiently answered my over analyzed swim form concerns (great coach, Estonian female record holder and SHE has gone sub 10hrs at Roth, gulp). The run to the changing tent was not too long and I had time to realize I was not too tired and ready spin my legs out for the next 180km. “I did not have a sandwich” is a transition inside joke I have with my friends and family as to why my transition(s) are occasionally too long (see time above!). Looking back now, its easy to say, “Why did I not do it quicker or more efficient.” Especially since most T1 times were half of my time. My race plan for bike attire was to change entirely into “bib bike shorts” just for the bike comfort the next 6-8 (god help me) hours. After the swim exit, I ran into the huge tent that had 5,200 transition bags, (2,600 swim to bike and 2,600 bike to run) I quickly found my number (plus we put little pieces of tape on the draw strings to differentiate it from the others) I then ran into the designated area where ladies could get dressed with just ladies (did you know some Europeans chicas wear NOTHING under their wetsuit!?) So it was with great surprise when I dug in my bag ready to get the bike segment going only to realize I grabbed my BIKE to RUN bag. Whoops! Luckily I still had some clothes on and back I went out to the zillion bag area to re-rack my BIKE to RUN bag then find my SWIM-BIKE bag (Tic, Toc). 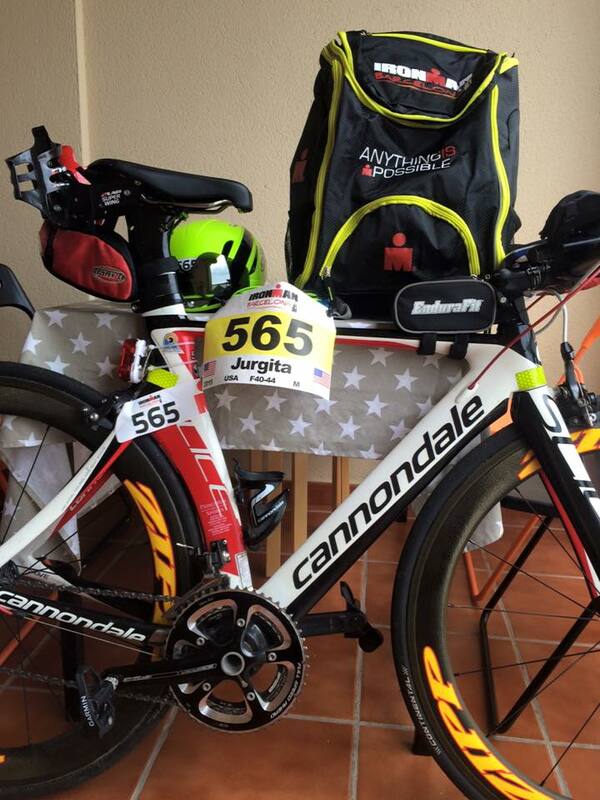 After grabbing the correct gear bag, I changed out, helmet and shoes went on and I jogged out to the 2,600 bikes. I was able to see Chris again as I grabbed my bike and he enthusiastically shouted encouragement. This was fun! The first few kilometers of the course was through twisty and slow town streets which allowed me to go over my cycle plan and to remind myself to focus on short segments of the course and not think of the time and length that’s still left. Not yet at least:-) A few months ago my kind bike fairy put a power meter on my bike, unfortunately I was not yet ready to use it this race and strictly went by my speed and heart race (no more than 10 beats above my MAF). Bike course was two and a half loops. Fist loop was great. I was enjoying the most breath taking views of the Mediterranean Sea as most of bike course was riding along the shore. I was keeping a great tempo and fueling as planned. Every 30 minutes, half of Sis bar was on the menu and on the hour I would take two sips of my Sis gel from the bottle. I practiced this plan on every long training ride so I knew if by heart, but I still had an index card with times and what to eat written out, just in case I bonked and needed some help with getting back on fueling track:-) I also planned to take one salt pill on the hour but the weather was not super hot and I just don’t pedal hard enough for me to get cramps so I only took two pills on the bike. For my liquids, I used a sipping system. I didn’t wait to get thirsty, but took 3-4 sips every 10-15 minutes (it’s a small tip I heard on Endurance Planet podcast with Stacy Sims and it really worked well for me). One issue I need to mention that I believe is caused by CarboPro is bloating and gas in the intestinal system. So thanks to a Mark Yost suggestion, I also took two Gas-X on the bike and then two on the run - worked like a charm. At 2:30 and 5:30 hours on the bike I consumed one ampoule of Liquid Magnesium - I mainly take it to improve muscle function and lessen fatigue. Not sure how much that played a part because half way into the bike I actually got bored and lost focus. I wasn’t tired or in pain, I was just simply lazy. Possibly a sign of fatigue. Room to improve as I believe the bike is my weakest sport. Later on the ride, when my knees and a hip started to ache I took two pills of Alive - drug magic again - woo hoo! When I finished my mix of CarboPro - I would discard an empty bottle at an aid station and grab their mix of PowerBar ISO. Knowing that’s what they offered at the race, I tried this mix on my long training rides and it had no negative effect so I decided to refuel with it. This race did not offer special needs stations, so my bike was a little heaver with extra gear. Bike was not all a disappointment, I am thankful for changing into full bike gear and for the Princeton Sports crew (especially Matt Takovich and Mike Stone) who sold me my Cannonade Slice with a great fit. I am proud to confess that this girl can make bathroom breaks right on the bike - yep, it took some effort, but I made it happen. It feels weird at first but kind of cool at the same time. Definitely had to soak and wash my bike (bike fairy strikes again!) and shoes after the race. 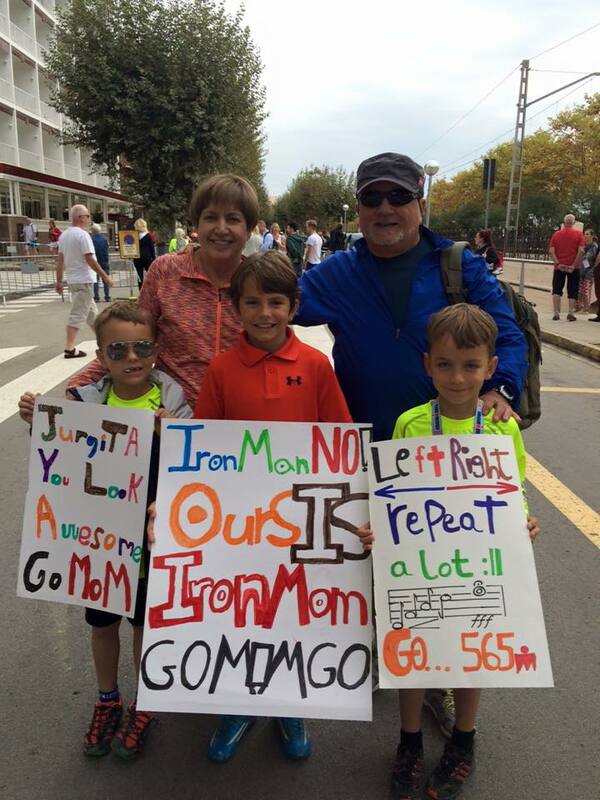 Also need to mention the jolt of energy I would get when I saw my family 5 time on the bike course. They had awesome messages on posters they made and Chris had a dry erase board with him that he would write different messages for me every time I passed him (“You can break 6 hours!” “You can stay in the top 20”- Nope didn't happen). I looked forward to reading them as I passed by them. Spanish people were also warm and welcoming. The streets and towns we rode through were lined with restaurants. People sat there all day and cheered on every single rider that went by. Vamonos….muy bueno…eres mi heroe …. It was energizing! Thanks Barcelona. While this time represents that I did a much better job getting into my run gear, can you believe I had another “wrong bag” moment. This time I grabbed a BIKE to RUN bag, except it was not mine. Really? Back to the rack again, lets grab MY bag this time. After applying glide on my toes and heels and a pair of comfy socks I slid into my pretty Lady Champion kit and I was of with determination to finish this thing. Inside my head, I was concerned about what could happen on the run but tried to not worry about the unknown too much taking one loop at a time (4 total). On the run, I carried no nutrition with me as I planned to use what race had at aid stations (4 opportunities each lap). Only a few small items fit into my race belt: one ampule of liquid magnesium (consumed mid race), chapstick, Visine eye drops, pain killers, GasX (ingested as needed) and 5ml bottle of Muscle Relieve essential oil. Right out of the gate I put a few drops of Visine because my eyes gets very red and irritated from the winds and dust on the bike. By 7k, I got my clear vision back and was able to focus on tempo and nutrition. At one of the aid stations, I grabbed a sponge and tucked it in my jersey. Every aid station I would take a bottle of water to drink and wet my sponge. Most of the the stations I drank coca-cola (big shot glass) and either gel or a banana. On the last loop I had a few shots of Red Bull (that felt like Jack Daniels at that point- good rush). I was really fortunate to be able to run the entire course only walking at aid station to refuel. The last two loops I started to feel my knee and hamstring tightening and that’s where the magic of Muscle Relieve essential oil came in. The crowds of cheering people were absolutely amazing and seeing my family 7 times on the run gave me a boost every time. I think Chris was surprised to see me running every time I passed, but I felt good and was able to keep a respectable pace. 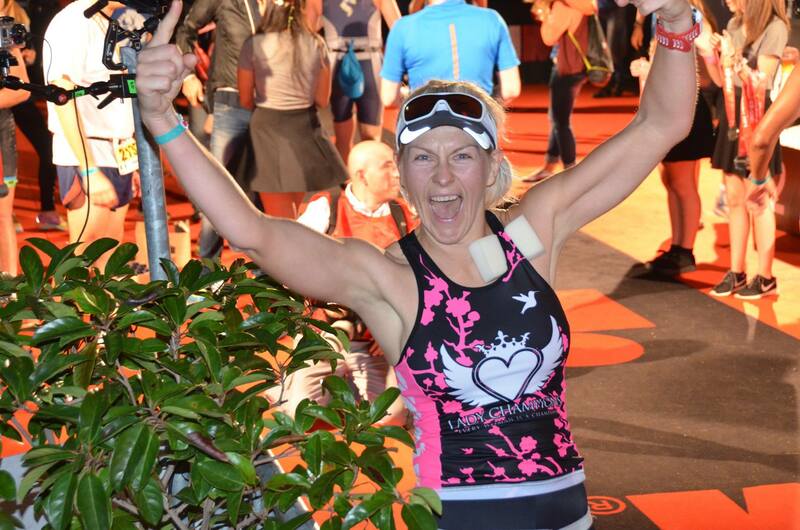 After you finish the last loop, you enter a red carpet chute that takes you towards the built stadium with fans, rock music and an announcer saying what every distance triathlete wants to hear, your name, “you are an Ironman”. The final seconds on the red carpet went way too quick, it was kind of a blur. I had tears in my eyes and realized that moment was finally here. I saw my family in the first row at the finish line and jogged across the line with my hands victoriously in the air. It was magic and looking back I wish I slowed down even maybe walk the final few meters to let it soak in a little more. Maybe next time (did I say that?). After I had several moments within a few meters of my family at the finish line arc, I was shooed along into the recovery tent. I prepared a plate of food and sat down next to other happy finishers. Within a few minutes, I realized I had to go the bathroom, now. For some reason, there were no bathrooms inside the big tent, so I had to go outside the area to where the spectators and runners were still racing. I was only able to say a quick hello to my awesome family and cheering section as I sprinted just in time into a port o john. That was just the first of many close calls I had that night. Good thing the marathon was only 26.2 miles and not 27 miles, because it would not have been nearly as much fun and a lot slower! After the first of many potty breaks, it hit me, I had to walk 1.5K to the bike area to pick up my bike, then 1.5k back to our apartment. Seriously!? Where is the shuttle? It was possibly the most painful and long part of my race day. The grandparents ferried the children back to our apartment and Chris escorted me as I used almost every potty along the way and rubbed my back as I dry heaved between bathroom visits. Not sure why this went on, but I could not wait to get my bike and back to our apartment. This process seemed to take hours. Originally, I planned to return at midnight to cheer on the last finishers, but in my condition, no bueno! Eventually, back at our apartment we could hear the announcer yell at the crowd to motivate those final racers to get to the finish before the cut off. A few hours later, I finally stopped my bathroom and face in bucket trips and closed my eyes for a few hours, only to lay in bed restlessly. Eventually I just got up at 3am and read. 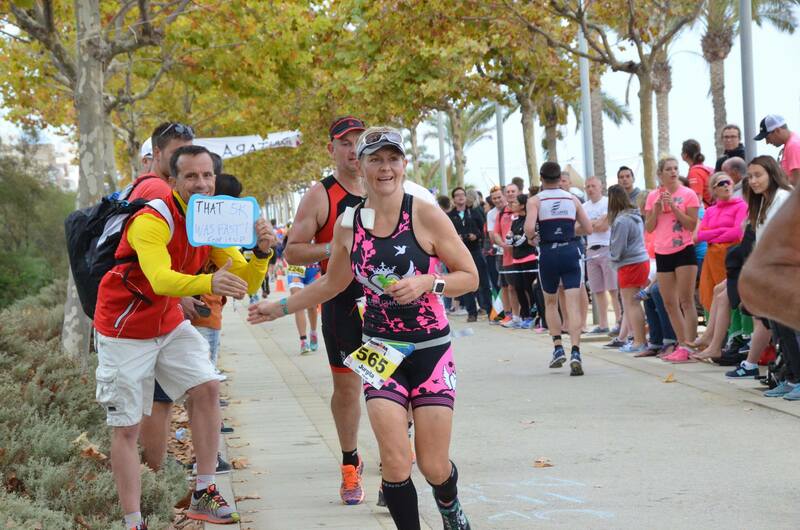 I learned the next day that sleeping after an Ironman is difficult for most. I guess your body is just jacked up in every way. Overall, I loved my race. I realize that many factors are involved in how your experience plays out. The most suffering I had was the 3k bike retrieval. I was lucky to get in quality training, make it to the start line fairly healthy and get through race day with very little drama (thank God!). The weather cooperated and the some what flat bike and run course played to my weakness. I had wonderful race support and so many variables just fell into place. I am also thankful for all my support from around the world. The crew from Mid MD Tri Club, Team LARC, Lady Champion, 21CC Triathlonclub and of course my family who endured my hilly emotions. I am lucky and feel blessed. A few weeks ago, I was adamant that I will never go through this again (Chris kept asking for it in writing as I usually vented on him) and now I find myself looking to do it doing again. Its Chris’s turn next year in Copenhagen, but I have a feeling I will again hit the “enter” button for more joy and suffering. I hope you enjoyed a snippet of my experience and maybe learned something new.